There were a number of differences between this flood and the one 2 years ago. The height of the Brisbane River at Moggill peaked around 8.5 metres (below the minor flood level) Tuesday morning, 29th January. In 2011 it peaked at 17.87m. Last time a lot of the bank collapsed and soil was swept away and along the river frontage a lot of sand was deposited. This time there has been a thick deposit of rich dark soil/mud which has buried some of the plants. Only one part of the bank in front of the goat gully has suffered a collapse. This time a lot of large timber was deposited parallel to the river and high up in the bays. Last time the water left behind loads of pulverised twigs (very good piles of mulch) which still rest high up in the branches of some trees. The flood has done us a favour by subduing the mollasses grass which will still need to be sprayed with herbicide. The weather was significantly different. We received a very welcome 400+mms of rain courtesy of cyclone Oswald in the week leading up to the flood. Last time there had been prolonged rain. This time we had some damage of trees because the rain was accompanied with wind. Last time the flood arrived on a peerless sunny day. *** There has been significant loss of plants in the subsequent period after the 2013 when water continued to be released from the Wivenhoe to follow a new policy of keeping the dam level at only 88% capacity. The release started at the end of January and continued intermittently as rain continued to fall in the catchment (*). So the river remained high over an extended period (covering the lower sections of the new plantings along the riverbank) and the water was travelling fast. In March it became clear that the force and level of the release had killed more plants than the actual flood. Some of the taller (new) gums had been bent over for so long that either the roots had broken or the plants had not appreciated being submerged in water for an extended period. In the area near the old pontoon the figs (which had been dug out of the mud and were still healthy after the flood) had not survived being underwater for another stretch of time. This has caused us to rethink our plans for revegetating along the riverbank as it could be a common occurrence in summertime(the cyclone season) to release excess water and the policy does not seem to be to release small amounts of water slowly. We will stick to planting lomandras, she-oaks and callistemons on the low side of the path past the 8 bays which are very hardy in these circumstances. The release did us one favour by driving back the Para grass- Urochloa mutica -again although it will still need to be sprayed regularly as it lines the riverbank upstream and downstream. 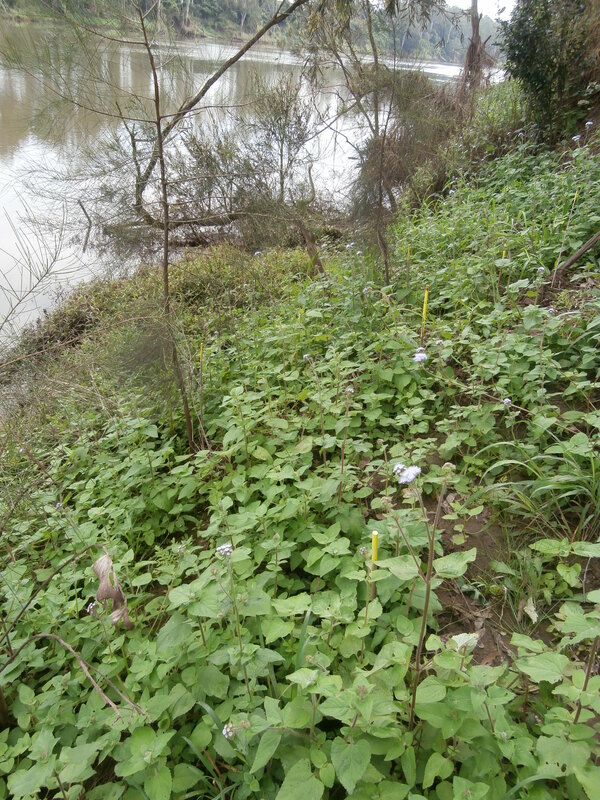 The dominant weed to flourish after the 2013 flood has been billy goat weed – Ageratum houstonianum. 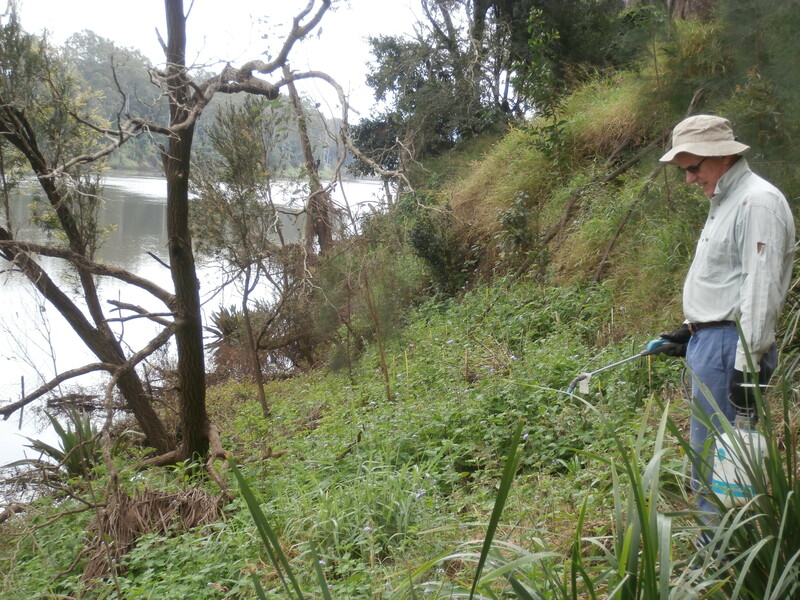 We will plant gums (mostly Eucalyptus tereticornis as they are best suited to flooding) higher on the bank to hold the soil. However we have loads of figs springing up around the property which we will transplant in abundance down there as it will not be a problem if they are washed away… another flood may not occur until they are better established. From 26th January til 7th March I received 15 notifitions via email of water releases from the dam.